The present collection presents the shrewd impressions of 1840s North America (preceding Dickens' visit in 1842) of a highly educated and cultured British aristocrat, a poet who exchanged sonnets with Wordsworth (one letter contains a lukewarm critique of the 'Excursion' of 'dear Wordsworth', which Morpeth has found time to read on his trip, and another contains a six-line original poem by Morpeth, later published by his sisters as 'Indian Names'), and the letters record his impressions of the American literary and social scene and his favourable response to the continent's scenery. 11 x 4cm, some staining, damage to text with further loss of text (as well as the rest of the letter), most of text and signature legible. Surviving text as follows: "[led?] Travels, Messrs Cassel Teller & [Sulpin?] wished [me?] to some lengthy paper, would it suit to [sic} you if". Note: Vambery, a friend of Bram Stoker's, is said to have been the model for Van Helsing, the vampire hunter in "Dracula.". 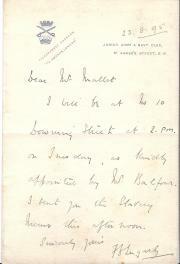 [ James Forbes; India ] Autograph Letter Signed "Jam Forbes" to [ Claudius Rich ], traveller and antiquarian (Babylon etc). James Forbes (1749–1819), author of ‘Oriental Memoirs’ (seventeen years residence in India); father-in-law of Marc Rene de Montalembert. Four pages, 12mo, very good condition. His correspondent's letter eventually reached him in Paris where he'd resided since the last August "in coinsequence of my son-in-law the Baron de Montalembert being appointed by the French Government Minister at the Court of Wurtemberg [...] but political reasons, and the difficulty of procuring a suitable house in that small capital have hitherto prevented our joining him." His daughter has to go through a "Municipal marriage" under the Napoleonic Code to establish her children's legitimacy. [ James Silk Buckingham, journalist and traveller. ] Autograph Letter Signed ('J S Buckingham') to 'W. Reid Esq', praising his effort to 'promote the Temperance cause' and complaining of declining powers. 13 George Street, London. 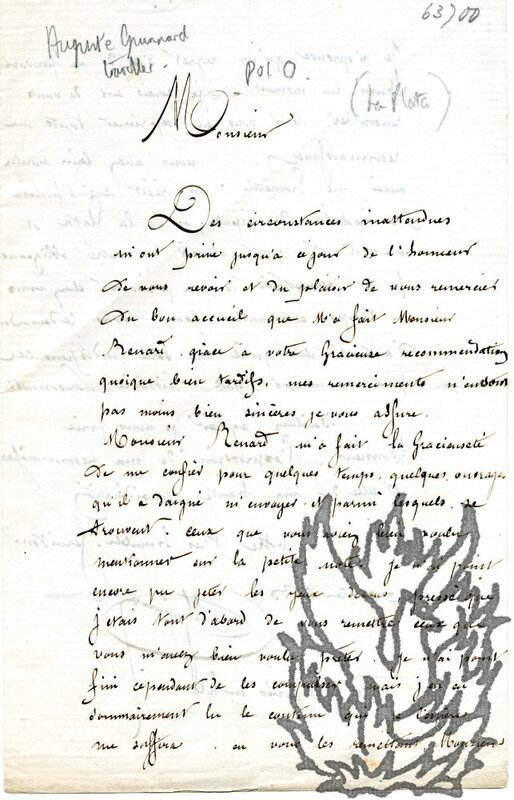 6 April 1846. 2pp., 12mo. Bifolium. In good condition, on lightly-aged paper. He has received Reid's 'Kind Note' and appreciates 'the motives which induced [him] not to print the Lines' (on an Indian prince?) in his journal. He sends 'every good wish' for the success of Reid's 'effort to promote the Temperance cause', but cannot contribute any articles, as he begins to feel his 'physical powers declining on the approaching age', and so is 'obliged to lessen rather than increase' his 'labors'. Alfred Grandidier (1836–1921), French naturalist and explorer. One page, 12mo, small closed tear on fold, ow good. "Monsieur Alfred Grandidier présente ses compliments au Secrétaire de Savage Club et accepte avec plaisir l'invitation qui lui a été faite pour demain samedi à 9h1.2 [9.30]." [Anglo-Jewish Association] Three Typed Letters Signed "Phineas L. May", Administration Officer, Anglo-Jewish Association, to George Bilainkin, "the editor of 'Illustrated'" "famous diplomatic correspondent"
[The Jewish Monthly] Phineas. L. May, Administration Officer, Anglo-Jewish Association. [Printed heading] Anglo-Jewish Association, Woburn House, Upper Woburn PLace, WC1 [London], January and February 1946. Total 4pp., 12mo, good condition. Letter 1 (25 Jan. 1946) He gives brief biographical detail, showing prior acquaintance, and praises an article of Bilainkin on Yugoslavia in the magazine 'Illustrated'. He says the Anglo-Jewish Asociation is "considering the publication in the near future of a National Jewish Monthly Magazine [...] and the Publicity Committee have asked me to approach you to become a co-opted member". He suggests lunch. [George Clarke Musgrave, English-born American soldier and writer] Two Autograph Letters Signed (both 'G. 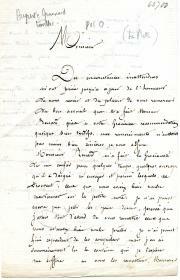 C. Musgrave') to a reviewer on the 'Figaro', concerning his book 'To Kumassi with Scott'. With printed publisher's flier and press cutting. 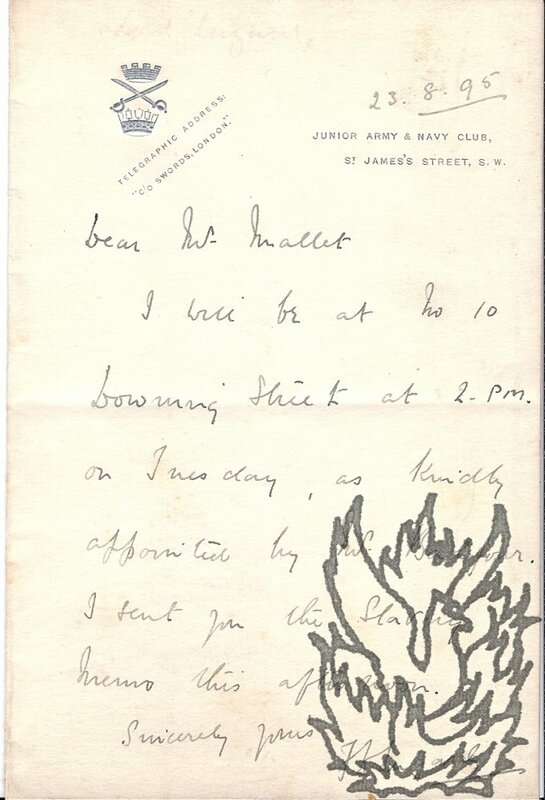 Both letters on letterhead of 12 The Leas, Folkestone [Kent, England]. 17 and 28 December 1896. Printed flier: Wightman & Co., "The Westminster Press," 104 Regency Street, London, SW. Undated. The two letters and flier are in good condition, on lightly-aged paper; the cutting is on aged newsprint, separated into two parts along a crease line. Letter One (17 December 1896): 2pp., 12mo. Bifolium. He informs the recipient that, as the review list for the book is closed, its publishers Wightman & Co have sent on the reviewer's letter to Musgrave. 'We are following this course as much interest exists between the North Country & West Africa. Autograph Letter Signed ('M Callcott') from the traveller and author Maria Callcott [previously Maria Dundas and Maria Graham] to the antiquary Edward Vernon Utterson. London; postmarked 26 May 1829. 1p., 12mo. Good, on lightly-aged paper. Addressed, with oval red postmark and broken red wax seal, on reverse of second leaf of bifolium to 'E. V. Utterson Esqre | 32 York Terrace | Regents park'. She writes that she and her husband are 'sorry to have so bad an account of Mrs Utterson', whom she will visit 'when she can see her friends'. 'Mr. Callcott [the landscape painter Augustus Wall Callcott (1779-1844)] was in York Terrace yesterday but having forgotten your number & finding you denied at three or four doors he began to think you had moved or that I had given him a wrong direction'. Autograph Note Signed "F D Lugard", colonial administrator, etc. to "Mr. Mallet", about a "Slavery Memo" and a visit to 10 Downing Street..
Frederick John Dealtry Lugard, 1st Baron Lugard, (1858 –1945), British soldier, mercenary, explorer of Africa, Governor of Hong Kong (1907-12), Governor-General of Nigeria (1914–1919). [Prhinted Heading] Junior Army & Navy Club, St James's Street, SW, 23 August 1895. One page, 12mo, faint marking and slightly grubby, text clear and complete. "I will be at No 10 Downing Street at 2. pm. on Tuesday, as kindly appointed by Mr. Balfour. I sent you the Slavery Memo this afternoon." Online biographies (Wikipedia and DNB) mention his activities indicating that he was anti-slavery (in the main! ), but don't mention activity resulting in a Memo. According to the DNB disappointments in England drove him back to Africa in 1895. Perhaps this was it. 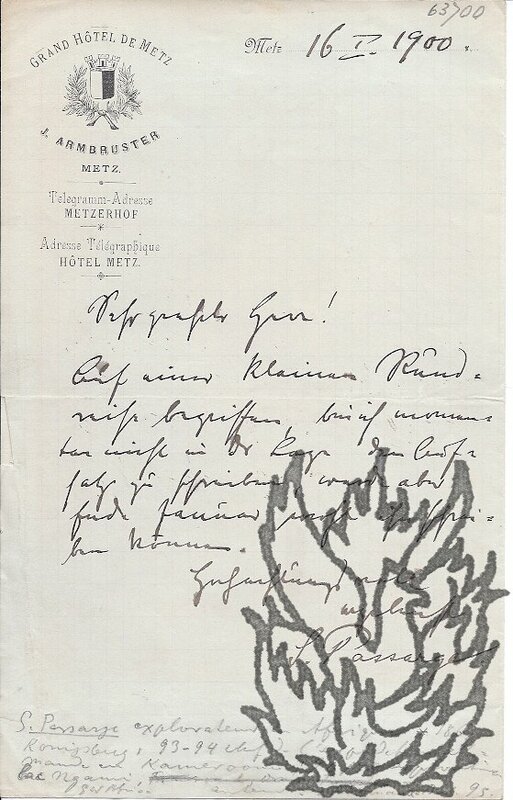 Autograph Note Signed "S. Passarge" (German geographer) to [E. von Thumen - on envelope]. Siegfried Passarge, geographer and geomorphologist known for his studies of southern Africa. 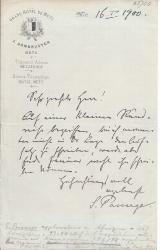 Autograph Letter Signed to "Mr Armstrong" [conceivably the industrialist]. With Autograph Note, initialled, also to Armstrong. Burlington, Eastbourne, 13 Sept. 1898 and no date [1890s]. [1898 letter], 2pp., 4to, closed tear on fold but mainly good, text complete and clear. "Here the answer to that vicious article in the Desdener Zeitung" [perhaps he had enclosed a letter or article - no longer present]. He asks for a careful copy and that Armstrong sign it and send it to the newspaper. "They must publish it on the strength of p.11 of our press law" subject to legal penalty. It will make a betetr impression if you sign it as I have spoken in it of my own risks(subscription of £2000 etc.etc)".